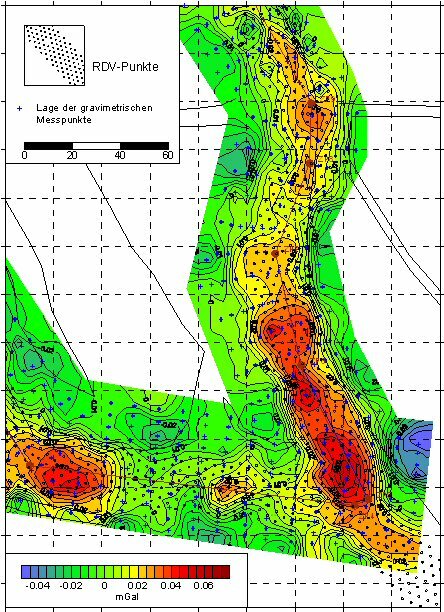 For the stabilization of a dump site of a lignite open cast mining, a compacted concealed levee was generated by vibro-tamping down to a depth of 10...15 m with a width of about 25 m. The aim of the investigations with micro-gravimetric measurements in an area of 1000 m x 50 m was to verify the homogeneity of this compaction and to localize possibly existing discontinuities. The area was covered by a grid of gravimetric points with an inline spacing of 5 m and a crossline spacing of 10 m.
Fig. 1 shows a part of the surveyed area. In general, increased values (coloured red-brown) of the local gravity field can be recognized in the vicinity of the central axis of the investigation area. These relative gravity highs indicate a sucessful compaction. But, some areas were found along the line where the compaction effect is less than expected indicated by lower gravity values. The results of the micro-gravimetric survey prove the capability of the method to evaluate the success and the homogeneity of such compaction measures. If the geometry of the compacted levee is roughly known, it would be possible to quantify the compaction effect using a 3D modelling. Copyright 2016 Geophysik und Geotechnik Leipzig GmbH. All rights reserved.